These large brachiopods are of the species Terebratula maugerii Boni, 1933. 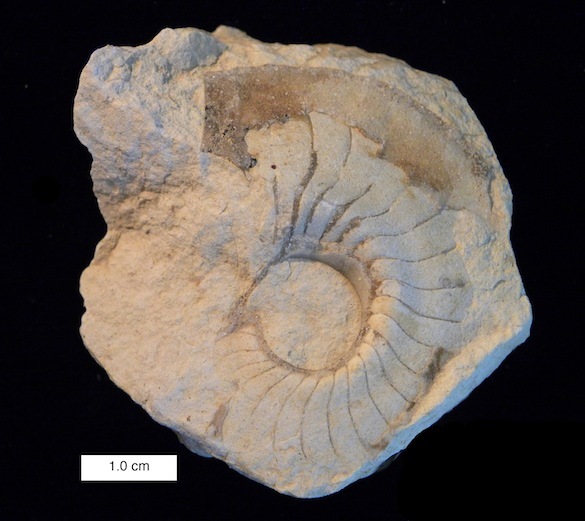 They were found in Upper Miocene (Tortonian-Messinian) beds near Cordoba, Spain. Wooster acquired them through a generous exchange of brachiopods with Mr. Clive Champion in England. The specimen on the left is oriented with the dorsal valve upwards. The ventral valve is below and visible at the top of the image. The ventral valve of terebratulids has a rounded opening through which the attaching device, called the pedicle, extended. The specimen on the right is shown with its ventral valve upwards. Since this is the largest valve, you can’t see the dorsal valve below. I like these specimens because they have that beautiful fold in the center of the shell. This is much more pronounced than in the usual terebratulid brachiopod (it is said to be “strongly plicated“), so students get to see some variety in this large but generally uniform group. Finally, brachiopods are commonly called “lamp shells“, which makes no sense to most modern students. They were given this nickname way back in the 18th century because of their resemblance to Roman oil lamps, such as those figured above in the same orientation as our shells. 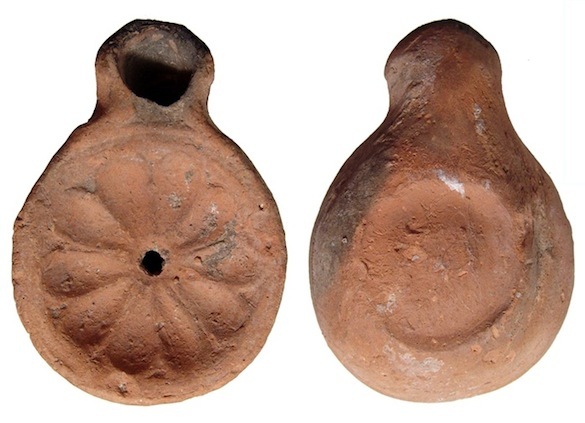 These were filled with oil through the central hole and a wick was placed in what we now see as the “pedicle opening”. It is an archaic comparison, but it works! Boni, A. 1933. Fossili miocenici del Monte Vallassa. Bolletino della Società Geologica Italiana 52: 73-156. García Ramos, D.A. 2006. Nota sobre Terebratulinae del Terciario de Europa y su relación con los representantes neógenos del sureste español. Boletín de la Asociación Cultural Paleontológica Murciana 5: 23-83. Llompart, C. and Calzada, S. 1982. Braquio ́podos messinienses de la isla de Menorca. Bol R Soc Espanola Hist Nat 80: 185–206. Reolid, M., García-García, F., Tomasovych, A. and Soria, J.M. 2012. Thick brachiopod shell concentrations from prodelta and siliciclastic ramp in a Tortonian Atlantic–Mediterranean strait (Miocene, Guadix Basin, southern Spain). Facies 58: 549-571. Toscano-Grande, A., García-Ramos, D., Ruiz-Muñoz, F., González-Regalado, M.L., Abad, M., Civis-Llovera, J., González-Delgado, J.A., Rico-García, A., Martínez-Chacón, M.L., García, E.X. and Pendón-Martín, J.G. 2010. Braquiópodos neógenos del suroeste de la depresión del Guadalquivir (sur de España). Revista Mexicana de Ciencias Geológicas 27: 254-263. These thin-shelled brachiopods were collected in the summer of 1996 on a Keck Geology Consortium project in Cyprus. Strangely enough, they were the first brachiopods I had ever seen in the Cenozoic. These are ventral valves of the terebratulid Maltaia pajaudi García–Ramos, 2006. On the left is the external view, and on the right is the internal. In the internal view at the top (posterior) portion of the shell you can see the rounded pedicle opening and two teeth of the hinge mechanism that articulated the valves. The fieldwork that summer was with three students: Steve Dornbos (’97) of Wooster, Ellen Avery of Bryn Mawr, and Lorraine Givens of SUNY-Buffalo State. We found hundreds of gorgeous fossils, many of which have been described in these webpages. All are from the Nicosia Formation (Pliocene) exposed on the Mesaoria Plain in the center of Cyprus near the village of Meniko. The brachiopods above were found at a site we termed “Pelican-Brachiopod” that had 37 different fossil species. It was an unusual paleocommunity with large numbers of predatory gastropods, many of which left their marks as boreholes in shells. We figured from the microfossils present, as well as the fine silty sediment, that this fauna lived in relatively deep waters, probably several hundred meters. We had other Nicosia Formation sites in very shallow waters (including a coral reef), so we were able to show considerable paleoenvironmental diversity in this thick unit. The Mediterranean brachiopod genus Maltaia was named in 1983 by the famous American paleontologist G. Arthur Cooper (1902-2000). I actually met the man in 1977 when I was an undergraduate attending the North American Paleontological Convention in Lawrence, Kansas. I was awestruck because he was legendary for his prodigious systematic work with brachiopods, especially those of the Permian in western Texas. 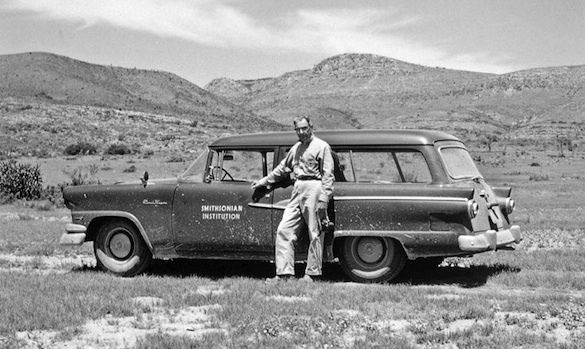 The classic photo above shows him in the field with his Smithsonian Institution vehicle he named the “Emerald Queen”. Cooper earned his B.S. degree at Colgate University with a chemistry major in 1924. He did his PhD work at Yale University with the epic paleontologists Carl O. Dunbar and Charles Schuchert, earning his degree in 1929. He loved brachiopods and was encouraged to pursue them by Schuchert. Cooper joined the paleontological staff at the United States National Museum in 1930, flourishing there through his retirement in 1974 into active emeritus status. He named hundreds of new fossil brachiopods during his career. I would not be surprised to hear he has the record of new fossil taxonomic descriptions. He was much honored in his time, including receipt of the second Paleontological Society medal in 1964. Bitner, M.A. and Martinell, J. 2001. Pliocene brachiopods from the Estepona Area (Málaga, South Spain). Revista Española de Paleontología 16: 177-185. Bitner, M.A. and Moissette, P. 2003. 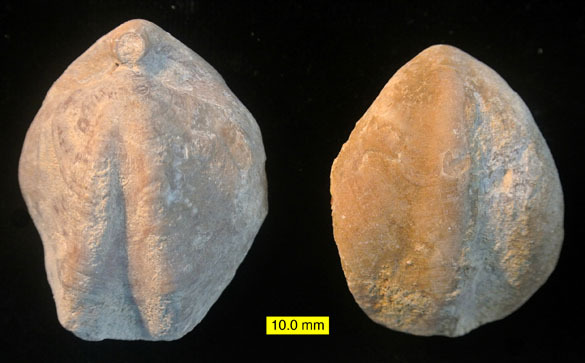 Pliocene brachiopods from north-western Africa. Geodiversitas 25: 463-479.
Cooper, G.A. 1983. The Terebratulacea (Brachiopoda), Triassic to Recent: A study of the brachidia (loops). Smithsonian Contributions to Paleobiology 50: 1–445. Toscano-Grande, A., et al. 2010. 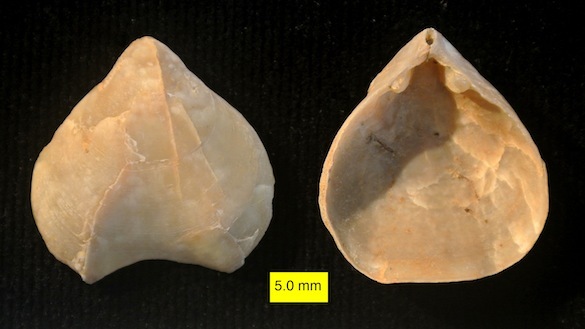 Neogene brachiopods from the southwestern Guadalquivir basin (south Spain). Revista Mexicana de Ciencias Geologicas 27: 254-263. 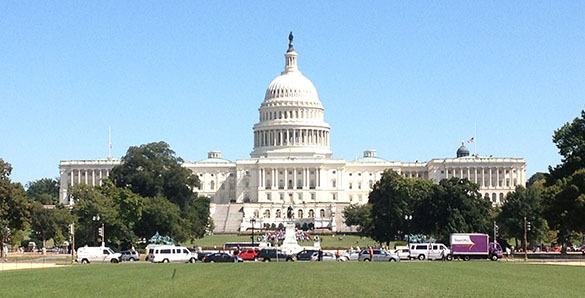 WASHINGTON, DC–Today I was in Washington, DC, with 70 other colleagues for the annual Geosciences Congressional Visits Day organized by the American Geosciences Institute (AGI). I was ostensibly representing the Paleontological Society as its secretary, but I was really a member of the Ohio delegation there to speak to staffers in the offices of Ohio senators and representatives. The weather was strikingly beautiful, and all the more lovely considering how much time I spent looking at it through windows in one office or another. The AGI organized this set of visits with great precision. We were split into state teams (my partner was Pete MacKenzie of the Ohio Oil and Gas Association), each guided by a coordinator (we had Julie McClure, a science policy fellow). Our Ohio team went to the offices of Senators Rob Portman and Sherrod Brown, Congressmen James Renacci and Pat Tiberi, and then we met with a counsel for the Senate Energy and Natural Resources Committee. We had a few minutes in each office to make the case for “steady federal investments” in Earth and space sciences. It was a difficult “ask” because of the diversity of agencies and constituents, so I hope our enthusiasm at least left an impression. I am SO grateful to Pete and Julie for their experience and leadership in our little squad. 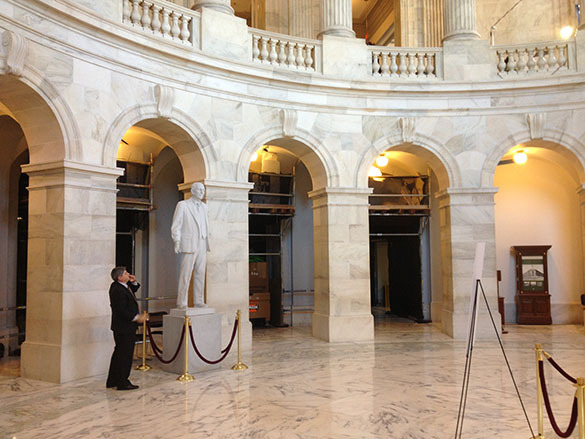 This is a rotunda in the Russell Senate Office Building, with Pete Mackenzie serving as scale. This is a spot commonly used for television interviews of senators. The statue is of Senator Richard Russell himself. 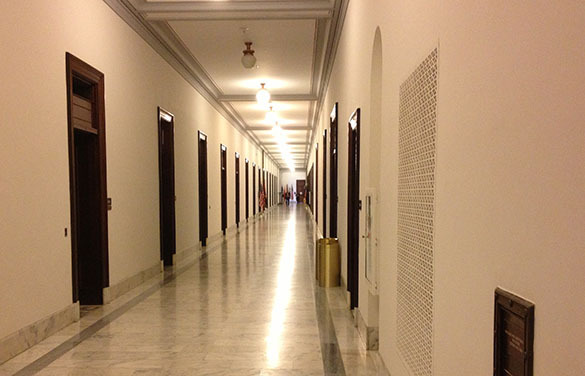 Literally one of the halls of Congress. This is again in the Russell Senate Office Building. 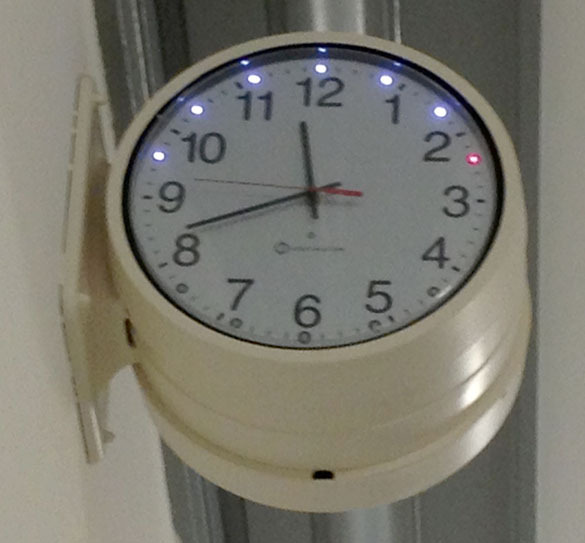 We saw these clocks throughout the Russell Senate Office Building. The lights indicate the number of buzzers sounded to call senators to various votes and quorum calls. The red light means the Senate is in session. 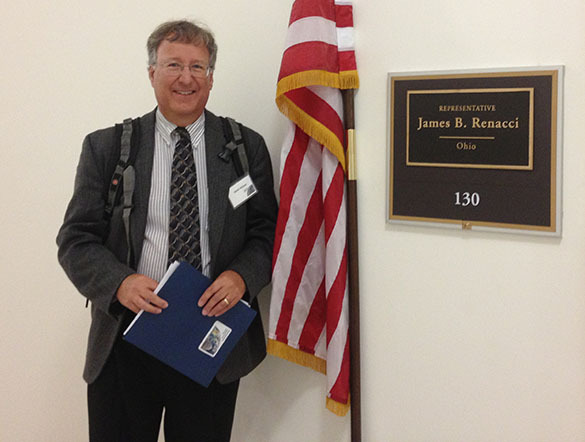 Yes, here is Country Mouse outside the office of his representative: James Renacci of the Ohio 16th District (“the fighting 16th!”). I felt casually dressed, and one staffer said I must be the professor with “that hair”. While I learned a lot, I can’t say I was comfortable with the process. I’m grateful for all the bright people who enjoy these things! OK, out of the offices in time for a little sight-seeing on the way back to the airport. 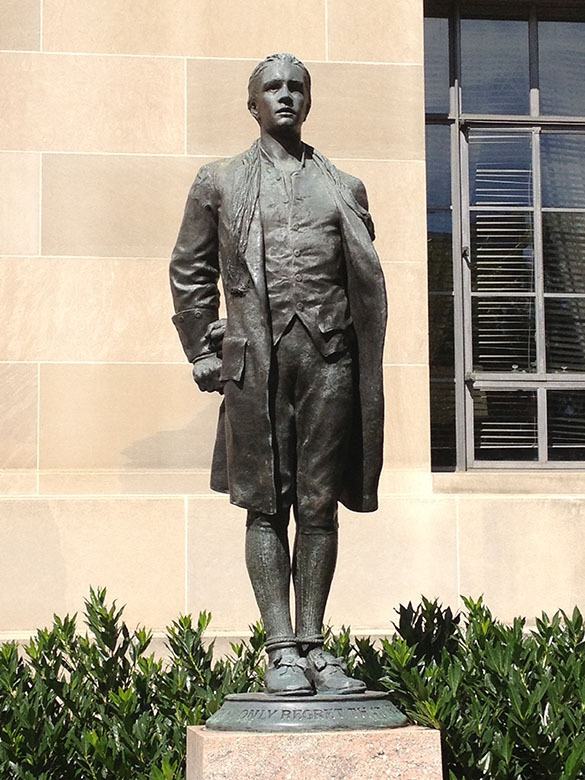 Here is one of my favorite statues in the capitol: Nathan Hale. This tragic hero looks so much like a college student to me. You just have to love democracy in action at the heart of our government! This is just one example of the many temporary and permanent demonstrations going on in the capitol. I’ve resisted showing you the displays of the anti-circumcisionists! Finally, there must be a little geology here. 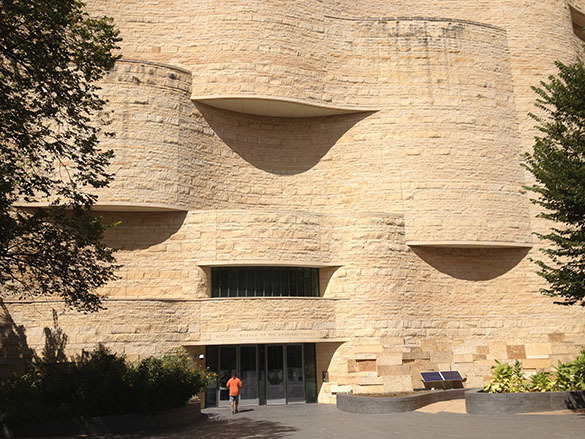 This was the first time I’ve visited the extraordinary National Museum of the American Indian. Highly recommended, and the food court is to die for. The architecture is intended to resemble southwestern cliffs of sandstone with inset dwellings. I think it is a spectacular success. Some of the stone is set with the bedding planes facing outwards. 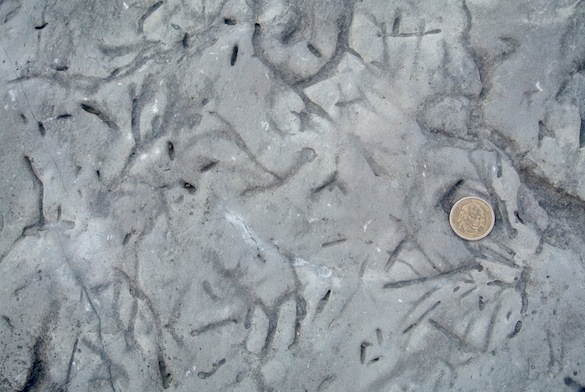 Several trace fossils are visible. These were formed by worm-like animals burrowing through muds sandwiched between layers of sand. I wish I knew the age and location of this deposit. My visit to Washington was an excellent experience and the basis for future such work with science policy issues. It was surprisingly easy to visit congressional offices, so one primary value of our trip was to show other scientists that their elected representatives are anxious to hear our opinions and use our knowledge and skills for crafting legislation. Of course, everyone we talked to was preoccupied by the latest political maneuvers associated with trying to pass a budget for the next fiscal year (good luck with that), but we were always listened to carefully and treated with respect. You may also notice in the top photo that the flags are at half-staff on the capitol building. 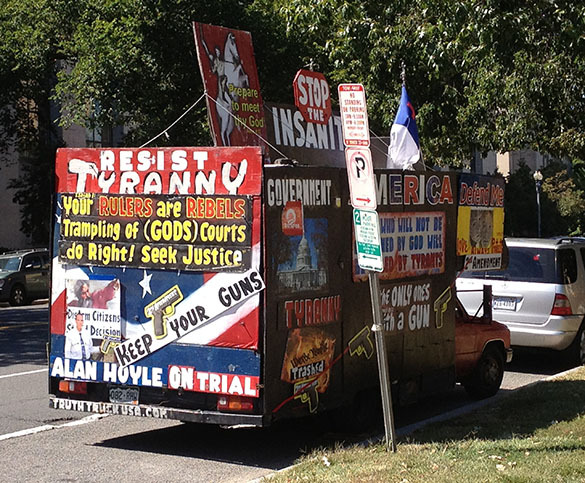 This is because on Monday, the first day of our training workshop, there was a mass shooting at the Navy Yard in DC. This tragedy was a shadow over us all, and it was a reminder of how important good governance is in an unpredictable world. 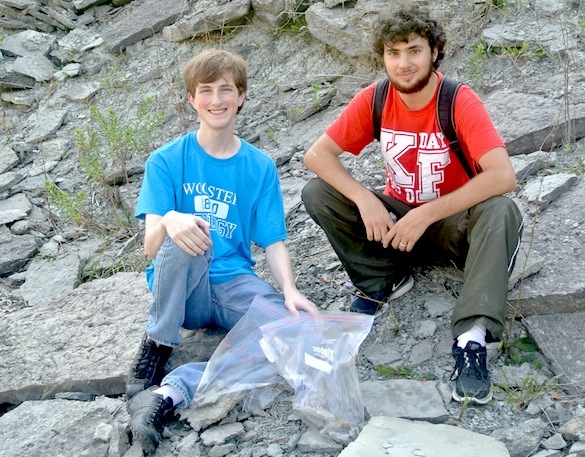 The 2013 Invertebrate Paleontology class at Wooster had its first field trip today. The weather was absolutely perfect, and the usual boatload of fossils was collected. We traveled this year to Caesar Creek State Park and worked in the emergency spillway created and maintained by the US Army Corps of Engineers for the Caesar Creek Lake dam. Exposed here are the Arnheim, Waynesville, Liberty and Whitewater Formations of the Richmondian Stage in the Cincinnatian Series of the Ordovician System. These units are enormously rich with fossils, especially brachiopods, bryozoans, trilobites, clams, snails, nautiloids, corals and crinoids. There is no better place to get students started on paleontological fieldwork, and to follow up with lab preparation, identification and interpretation throughout the semester. 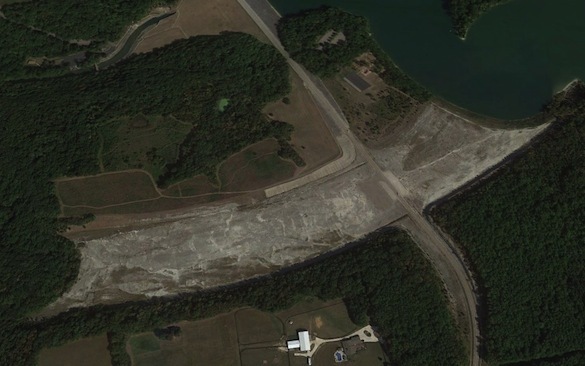 The Caesar Creek Lake emergency spillway is at N 39.480069°, W 84.056832° along Clarksville Road just south of the dam. The authorities keep it clear of vegetation, and so it is an extensive exposure of bare rock and sediment. The sharp southern boundary is the rock wall shown in the top image (with the intrepid Willy Nelson and Zach Downes). Students quickly fanned out along the entire exposure, so I never did get an image of the whole class of 22 students in one place. 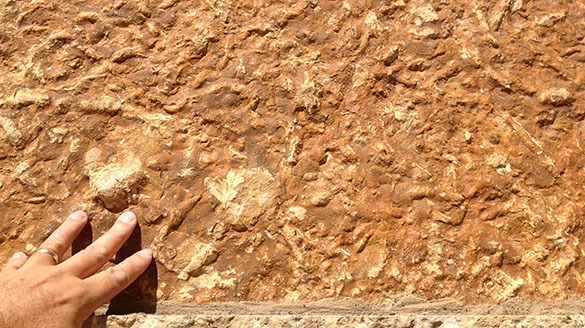 This is the bedding plane of a slab of micritic limestone with numerous worm burrows. Trace fossils are very abundant here. 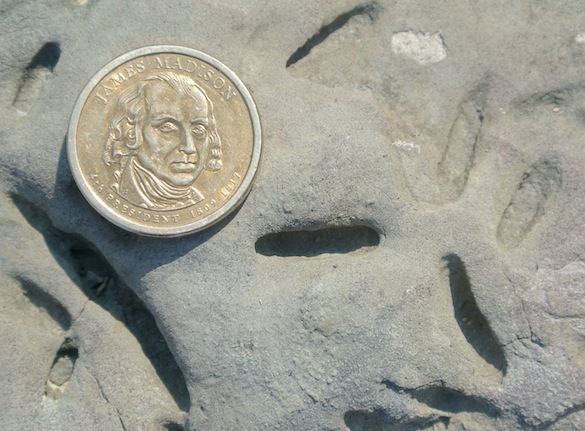 These units, in fact, have some of the first trace fossils to be specifically described in North America. 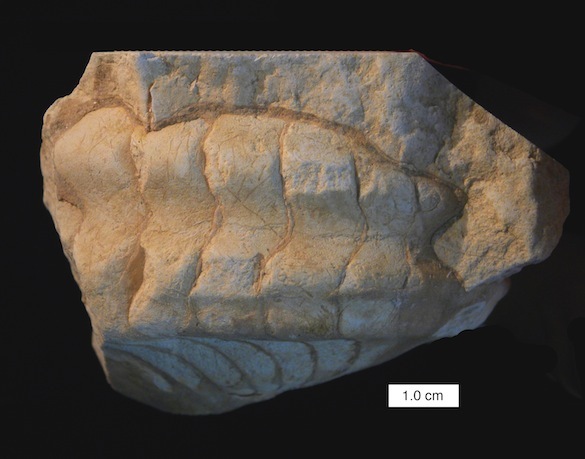 On some limestone slabs are internal and external molds of straight orthocerid nautiloids. They are often paired like this, with both facing in the same direction. This is an effect of seafloor currents that oriented the shells. The current here was flowing from the left to the right. 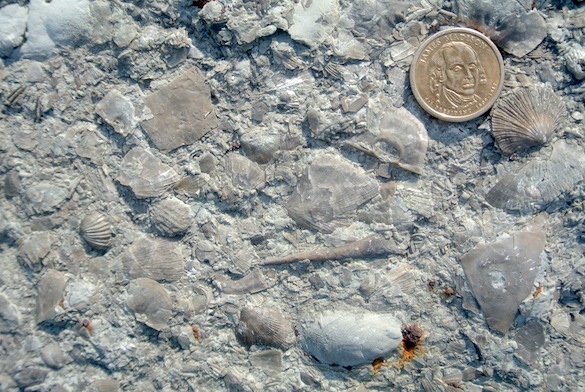 Many of the limestones are extremely rich in shelly fossils. Here you can see several types of brachiopods, an isotelid trilobite genal spine, and some molluscan internal molds. I always check in here with my favorite borings: Petroxestes pera. These are bivalve incisions on a cemented seafloor (a carbonate hardground). This is the type area for this ichnogenus and ichnospecies. Two of our sophomore paleo students, Michael Williams and Adam Silverstein, are here happily filling their sample bags with fossils. I wanted to get a photo of them in the field because they had such a geologically adventurous summer in both cool and wet Iceland and hot, dry Utah. Not many sophomores have these opportunities! Here is another pair of nautiloids, this time showing the characteristic internal mold features of curved septal walls. Again they are nestled together and oriented because of seafloor currents. For the rest of the semester the paleo students will be studying the fossils they collected today, each eventually constructing a paleoecological interpretation based on their identifications and growing knowledge of marine invertebrate life habits and history. Now we’re really doing paleontology! This is the first nautiloid specimen I’ve seen in the Matmor Formation (Middle Jurassic, Callovian) after ten years of collecting in it. Our colleague Yoav Avni (Geological Survey of Israel) picked it up during this summer’s fieldwork. It is a beautiful internal mold in which the outer shell has been mostly removed, revealing the radiating lines where the internal walls (septa) intersected the outer shell. These intersections are called sutures. Here we see nice, simple sutures characteristic of nautiloids. Ammonites, on the other hand, can have very complex sutures indeed. Note that some of the outer shell still remains as an orangish layer recrystallized to calcite from the original aragonite. There are two round holes in the foreground. I’d like to think these are tooth marks from a predator, but there is not enough evidence to say that with any seriousness. This view of the outer edge of the top specimen shows a diagnostic feature of this particular genus: a deep sulcus (channel) running along the venter (periphery). Most nautiloids have a rounded venter, so this characteristic stands out. 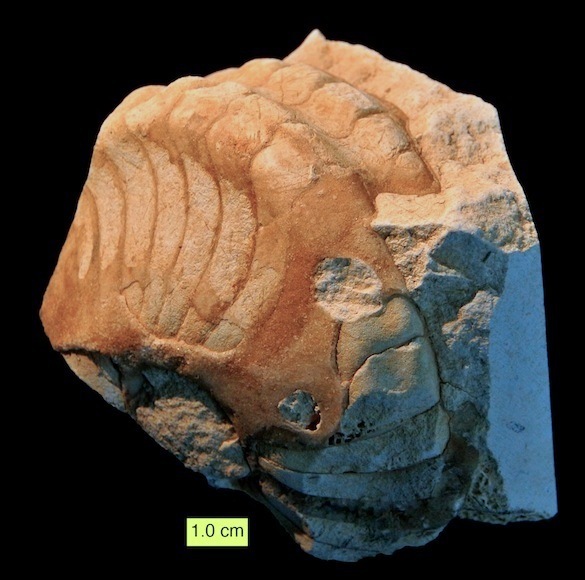 This is a side view of another specimen of the same nautiloid, also found by Yoav. The large hole at the center of coiling is called the umbilicus. It is especially large in this Matmor nautiloid. Note again the radiating sutures where the outer wall has been removed. This nautiloid appears to belong to the genus Paracenoceras Spath 1927. I had to have this beaten into me by a half-dozen cephalopod workers. I thought it looked a lot like Cymatonautilus collignoni Tintant, 1969. If so, it would have been a new occurrence of this rare genus — the closest it has previously been found is in Saudi Arabia. Most importantly, it would have been a range extension for this genus. Previously it has been well documented as having appeared in a very short time interval: the latest early Callovian into the middle Callovian. In the Matmor Formation we found it in a bed in the upper Callovian, specifically subunit 52 in the Quenstedtoceras (Lamberticeras) lamberti Zone. Alas, my dreams of a paper describing this discovery was not to be. Another beautiful idea skewered by reality. Paracenoceras was described by Leonard Frank Spath (1882-1957) in 1927. Spath was an interesting character. He was a British paleontologist who specialized in ammonites, but also delved into other cephalopods like our nautiloid genus here. He was a BSc graduate of Birkbeck College in 1912, eventually earning a doctorate at the same institution, now known as Birkbeck, University of London. He was a curator in the British Museum (Natural History) for most of his career. He was especially interested precise Jurassic and Cretaceous biostratigraphy using ammonites. He published more than 100 papers and monographs, was elected as a Fellow of the Royal Society, and received the Lyell Medal from the Geological Society of London in 1945. Spath was well known for his biting criticisms of German paleontologists, especially those who worked on ammonites. Turns out that he was keeping a secret from everyone, including his own children: his parents were German! His son (F.E. Spath) discovered this long after his death, publishing an account of his father in 1982. The elder Spath no doubt kept his German heritage secret for the obvious reasons, given his time and place. Branger, P. 2004. Middle Jurassic Nautiloidea from western France. Rivista Italiana di Paleontologia e Stratigrafia 110: 141-149. Halder, K. 2000. Diversity and biogeographic distribution of Jurassic nautiloids of Kutch, India, during the fragmentation of Gondwana. Journal of African Earth Sciences 31: 175-185. Halder, K. and Bardhan, S. 1996. The fleeting genus Cymatonautilus (Nautiloidea): new record from the Jurassic Charl Formation, Kutch, India. Canadian Journal of Earth Sciences 33: 1007-1010. Kummel, B. 1956. Post-Triassic nautiloid genera. Bulletin of the Museum of Comparative Zoology 114(7): 320-494. Spath, F.E. 1982. L.F. Spath (1882 – 1957), ammonitologist. Archives of Natural History 11: 103-105. Tintant, H. 1969. Les “Nautiles à Côtes” du Jurassique. Annales de Paleontologie Invertébrés 55: 53-96. Tintant, H. 1987. Les Nautiles du Jurassique d’Arabie Saoudite. Geobios 20: 67-159. Tintant, H. and Kabamba, M. 1985. The role of the environment in the Nautilacea, p. 58-66. In: Bayer, U. and Seilacher, A. (eds. ), Sedimentary and Evolutionary Cycles. Lecture Notes in Earth Sciences, vol. 1, Springer (Berlin). Every year in the first class session of my Invertebrate Paleontology course I give my students each an unknown fossil. It must be something relatively common so that I can give 20 nearly-identical specimens, and it is ideally of a species that can be identified (eventually) using web resources. This year I gave each student the strophomenid brachiopod shown above. Now James Hall left us a bit of a puzzle with Strophodonta. 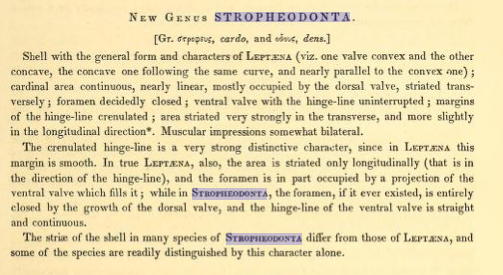 In 1852 he published his original description of the genus and called it “Stropheodonta” (see above from the original). Note the addition of the “e”. 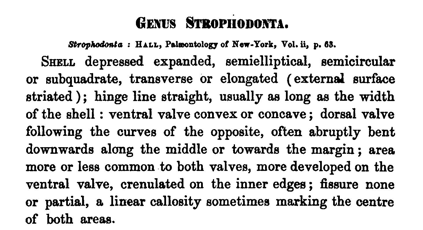 However, as you see above, in 1858 Hall referred to the same genus and spelled it Strophodonta, without the “e”. This is not only another spelling, it is another pronunciation of the name. He even retroactively refers to his 1852 name as Strophodonta as if he is correcting the spelling. (And indeed, he has “Strophodonta” also in the text of the 1852 monograph, but not in the description.) We’re thus faced with two names for the same genus, which is very naughty in taxonomy for obvious reasons. Today when you search for “Stropheodonta” on Google you get 3850 hits. Searching for “Strophodonta“, though, produces 121,000 hits. The Treatise on Invertebrate Paleontology is where we go to resolve problems like this (if an updated version is available). It turns out there that “Stropheodonta” is corrected as Strophodonta. Hall’s retroactive spelling change was accepted and Strophodonta is now the proper spelling and pronunciation. “Stropheodonta” is now a nomen vanum, or “vain name”. This means that it has “unjustified but intentional emendations”. Ah, the legalese of scientific taxonomy! Obscure but essential for keeping our language relevant and useful. Conrad, T.A. 1842. Observations on the Silurian and Devonian systems of the United States, with descriptions of new organic remains. Journal of the Academy of Natural Sciences, Philadelphia 8: 228–280. Hall, J. 1852. Palaeontology of New-York, vol. II. Containing descriptions of the organic remains of the lower middle division of the New-York System (equivalent in parts to the Middle Silurian rocks of Europe). C. Van Benthuysen Printers; Albany, New York, p. 63. Hall, J. and Whitney, J.D. 1858. Report on the geological survey of the state of Iowa: embracing the results of investigations made during portions of the years 1855, 56 & 57, vol. I, part II: Palaeontology. C. Van Benthuysen Printers; Albany, New York, p. 491. Williams, A., Brunton, H.C. and Carlson, S.J. 2000. Treatise on Invertebrate Paleontology. Part H, Brachiopoda Revised, Vol. 2: Linguliformea, Craniiformea, and Rhynchonelliformea (part). Treatise on invertebrate paleontology. Geological Society of America, Boulder, Colorado.